You can't have a proper Beatles' site without mention of Bill Harry who is forever a part of Beatles' history, and is alive and well and now running an online edition of his Mersey Beat magazine. Bill Harry actually shared a flat with John and Stu in their Art College time. They were friends and he was becoming an expert on the Liverpool 'beat' scene while the others were playing their music. He must have seen something in his mates the rest of the world hadn't realized yet. 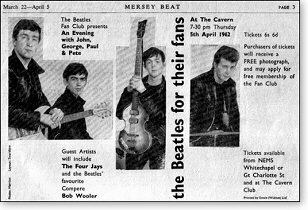 While the Beatles were playing gigs in Hamburg, Bill started a newspaper called Mersey Beat, keeping tabs on new groups and clubs. The Beatles were still pretty much unknown when they returned from Hamburg, but Bill started promoting them in Mersey Beat as the BIG band of Liverpool, I'm sure a lot of this had to do with their friendship and goes to show how much intrinsic magic was involved in The Beatles story. Liverpool teens loved them and they were booked for bigger type gigs at Litherland Hall, soon becoming sought after by dance hall owners throughout Liverpool. Mersey Beat newspaper was launched in 1961, and this is how Brian Epstein actually discovered The Beatles. Bill Harry coined the phrase 'Mersey Beat' and on July 6th, 1961, John Lennon would give the publisher an interview on how the name "Beatles" came about: "Many people ask what are Beatles? Why Beatles? Ugh, Beatles? How did the name arrive? So we will tell you. It came in a vision - a man appeared on a flaming pie and said unto them, 'From this day on you are Beatles with an "A". 'Thank you Mister Man', they said, thanking him. And so they were "Beatles." Bill Harry helped shape Beatle history from the very beginning, giving him a personal view into this world wide Beatles phenomena. He introduced John Lennon to Stuart Sutcliffe which was instrumental for what was to come. He gave The Beatles their first major publicity, and he brought the group to the attention of Brain Epstein. No matter how modest he may appear his place in Beatles history is cemented for all time. I've had the pleasure of talking to him via email and he is a genuinely very nice guy. 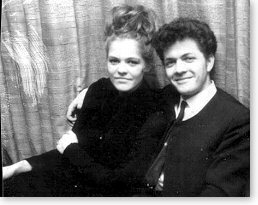 In the 60's Bill and his wife Virginia were dubbed "Mr. and Mrs. Mersey Beat" by journalist Nancy Spain, who featured them in News of the World. Bill met Virginia in 1960, she was 16 years old and from the time they met they spent all their time together, frequenting the different clubs, meeting lots of people, they seemed to always end up back at the Jacaranda Club, where Bill met Virginia. 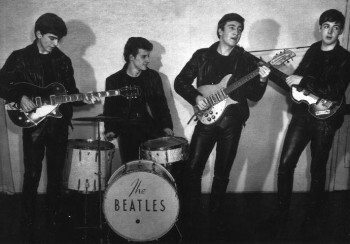 John, George and Paul were also regulars along with various other artists. The couple spent their time escorting and helping out anyone promoting the Mersey scene. Working long hours already, this is when the couple decided to publish a newspaper. Upon getting the money to get started, they worked in an attic space as their office. Virginia gave up her job and began working at the office full time for very little money, times were tough. John, George and Paul stopped in regularly to help her out, while Bill was out getting advertising and delivering issues of the paper as well as interviewing and organizing photo sessions with musicians. Virginia was the other half of the business. She dealt with all the paperwork and phone calls in the office, and became very knowledgeable and supportive of all the artists and had a good ear for the music. Her work behind the scenes wasn’t acknowledged as it should have been during the time of the Mersey Story, but behind all good men, you’ll find a good woman. Virginia was the woman in Bill's life that helped them become the success they are today. Bill's current projects include the online version of Mersey Beat which features many of the original publications as well as new articles. You can find numerous articles about The Beatles (as well as The Cavern Club and the Mersey Sound). 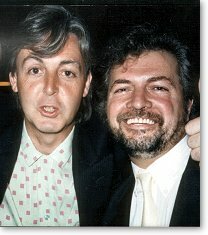 Original articles by Paul McCartney on his time in Hamburg, George Harrison, Brian Epstein, Pete Best, and the founder Bill Harry. I bet most of the biggest Beatle fans haven't seen these articles. An alphabetical arrangement of over 1,500 entries, this book concisely comments on every song, album, personality, concert, career highlight, television appearance, and film appearance anyone could possibly think of concerning the Beatles. It is a completely awe inspiring book and a fantastic reference tool for those needing quick answers to Beatle questions. Bill's accomplishments are many, he managed Press Campaigns for a long list of record labels; CBS, EMI, Polydor, just to name a few. Bill is also credited with twenty plus publications. His writings of the Beatles and the circles they traveled are extensive. Having been friends with the "Fab 4" from the beginning, Bill's and Virginia's work is a true testimony of life with "The Beatles."